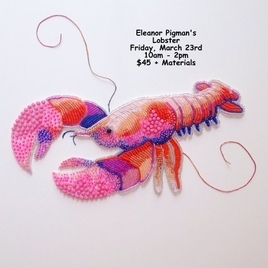 Join us in celebrating the art of beading! 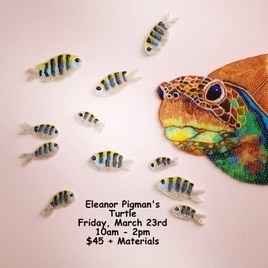 Make your plans to visit the Tampa Bay area this coming March 2018! We are located in Upper Tampa Bay near Oldsmar, FL. Check out the links at left for more fun stuff to do in our area! 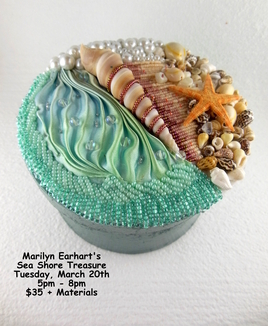 Take your pick, a wooden box, a necklace or a metal tin and you're at the sea side. 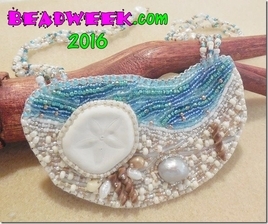 Shibori silk ribbon emulates the waves and the rest is up to you. 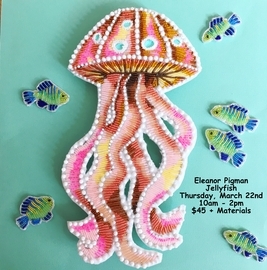 As you learn various techniques you will create your own tide pool. 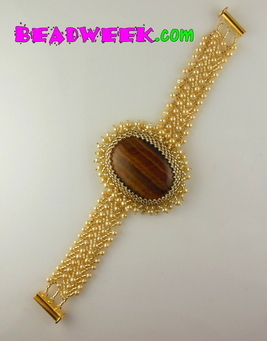 Sophisticated and a bit exotic, this wide bracelet is packed with sparkle and mystery. 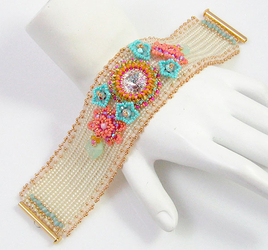 Stitches used to make this bracelet are vertical netting and simple embellishing. 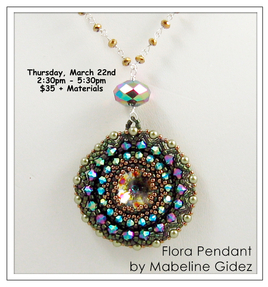 Make a large, crystallized medallion with a Swarovski rivioli stone. 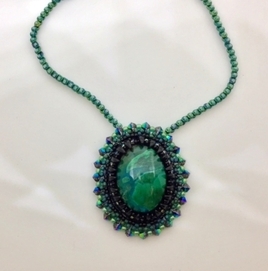 Learn how to make a beaded bezel around this dazzling stone and then expand your bezel to form this magnificent pendant. 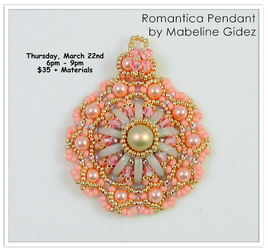 Create your own lacy medallion using 2 holed crescent beads, pearls, crystals, and seed beads galore! 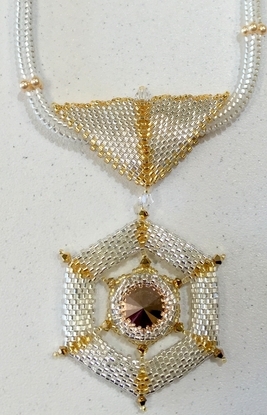 Primary stitches used to construct this intricate looking pendant are right angle weave and circular netting. Inspired by soft silk flowers, this design was born. 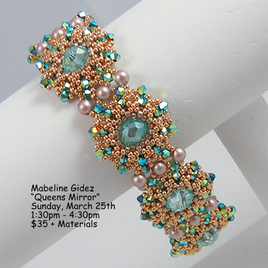 Bezel a rivoli stone and then create a stylized flower using crystals and seed beads in various sizes and shapes. This is definitely an attention getter! 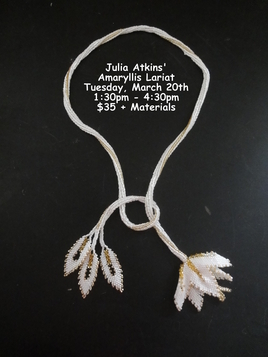 This necklace pays homage to a variety of teachers and techniques. 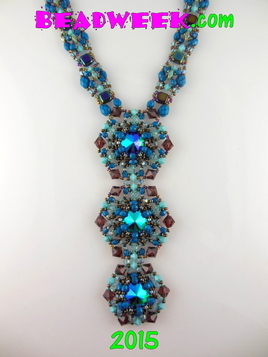 Peyote as Cellini, CRAW with embellishment and captured crystals come together in an show-stopper. 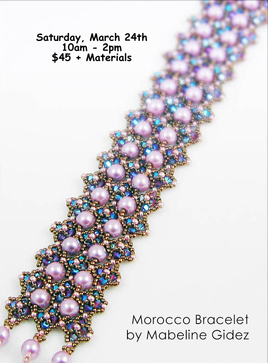 Inspired by ornate Moroccan gates, this crystal clover themed bracelet will definitely whisk you away to someplace exotic. Primary stitch used to create this is one needle, right angle weave stitch. 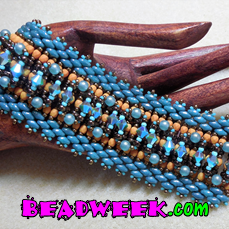 Load up on our Czech O beads, SuperDuos, and those lovely 3mm glass beads! 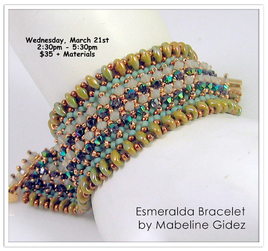 Time to make something beautiful with just one stitch – right angle weave! 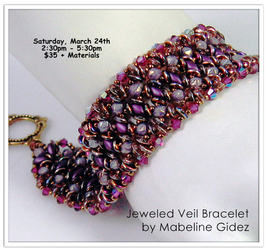 Like a dark veil hides the beauty of a woman, within this bracelet is hidden a simple technique that yields something more intricate than it truly is. 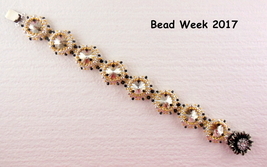 Learn how to use those Super Duos beads and crystals to make a stylish and sparkly bracelet! 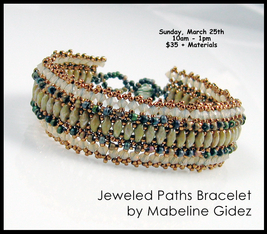 The Duo beads form a path down the center with crystal channels along the sides of your bracelet. 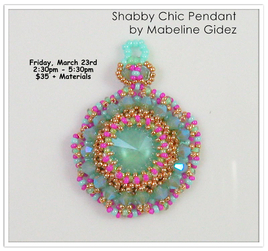 Inspired by enchanted mirrors in favorite fairytales, this design was brought to life. 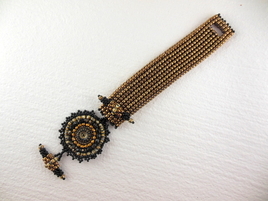 Kissed with sparkling details throughout, you will learn how to weave this ornate mirror motif. 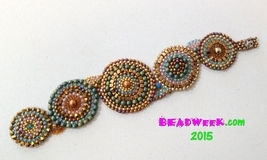 Stitches used to create this piece are: tubular peyote stitch, netting and right angle weave. 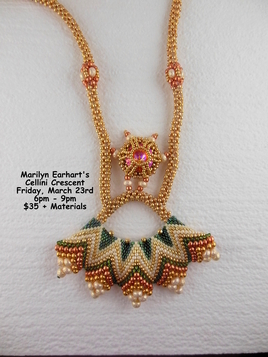 Join Marilyn and learn how to make this fabulous 3D Pendant. 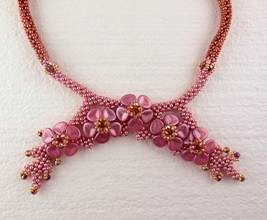 This star shaped flower consists of five ovate brick stitch petals using seed beads. 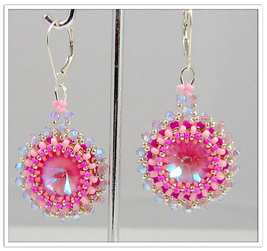 The petals are joined together by a netted calyx embellished with crystals. 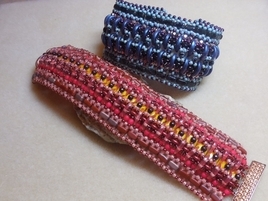 A detachable bale in netting stitch can be added to the flower. 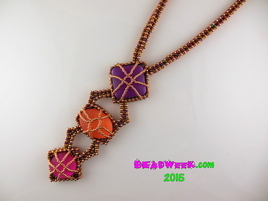 A reversible pendant to be whimsical or realistic. 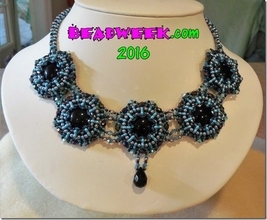 Using two luna soft cabochons, crystals, and Polaris beads with seed beads, you’ll want to make one for every outfit you own. 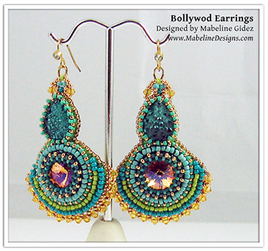 These rivoli crystals are encased with beads and are elaborately decorated with bicone and round crystals surrounded by a scalloped edge. 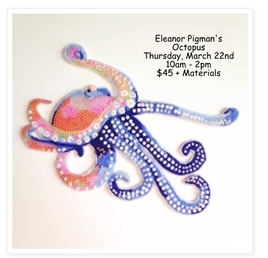 They can then be attached to a peyote spiral rope. 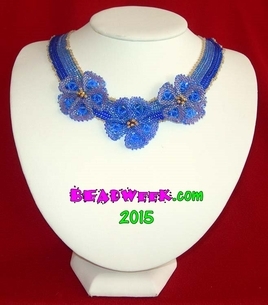 This delicate netted necklace in seed beads is embellished with crystals and delica flowers using peyote stitch. 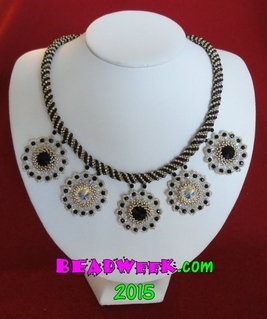 The pearl fringeing adds the finishing touch to this dainty necklace. 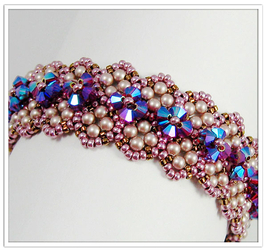 Luna Berry is a right angle weave cuff bracelet with a little bead embroidery to capture the Luna soft cab. 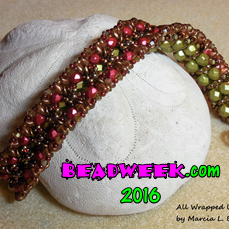 Students will find out why using berry beads in right angle weave is so popular! They work just great. 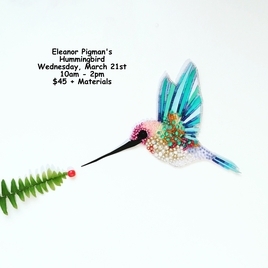 The touch of embroidery in this class teaches the basics of embroidery and is a great way to capture the square Luna Soft cab. 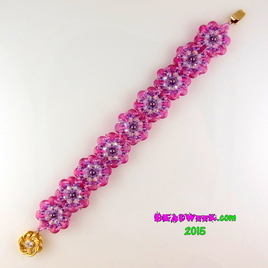 Pocket Full of Posies is a great bracelet using CzechMate lentil beads to create the flowers. 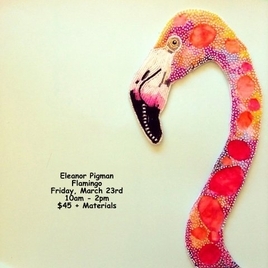 There is a lot going on with this design to make it work. 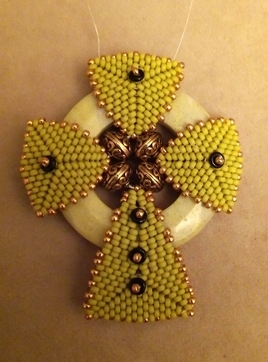 The backside has a layer of tiny bugle beads as a base for the posies. It is a tad slow going but totally worth the work. 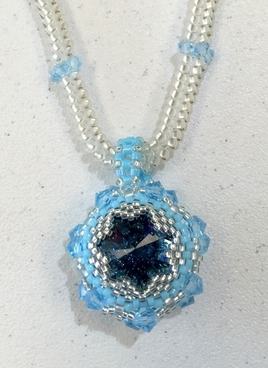 The five petals of the cornflower are made with delicas using an open peyote triangle embellished with crystals and joined by a tiny cluster of crystal stamens. 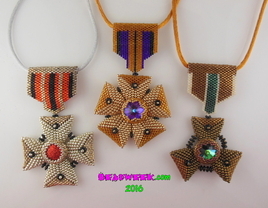 These can then be attached to a neckband or rope of your choice. 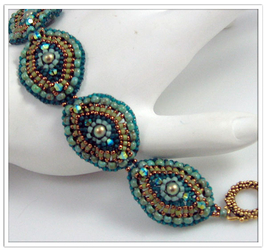 Miyuki Seed Beads, Preciosa Crystals & Pearls, Czech Glass, Gemstones, TierraCast Findings & More!